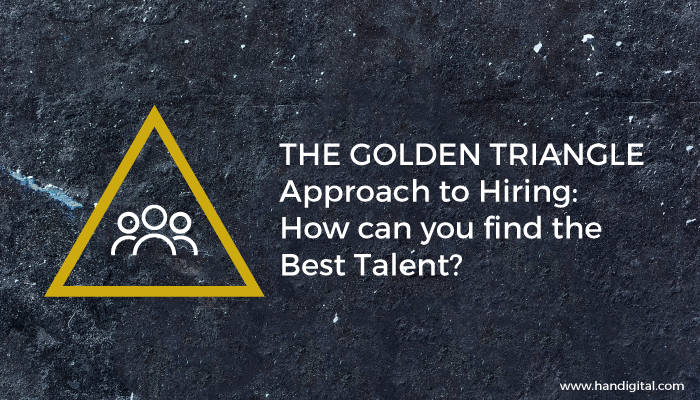 The Golden Triangle Approach to Hiring: How can you find the Best Talent? Employees are one of the most valuable assets of any organisation. They drive your business to success and are an important element in brand building. They represent you and your company. However, finding passionate candidates, who could be an asset to your organisation, can be a challenge in itself. But by using the Golden Triangle Approach in the Hiring Process you can fish the right person with the right talent to your organisation. The Golden Triangle Approach is a set of procedures that are interlinked and interdependent on each other. It is called the Golden Triangle because each vertex is considered valuable and crucial in the Hiring Process. If you follow these procedures closely during recruitment, you can surely find some of the best people to work with. The mundane trend while recruiting candidates is that you flip through their resumes, ask a couple of questions and voila! You believe that you have hired the best talent. But, in reality, you could end up recruiting the wrong person. Always be result oriented, which means that you need to stay focused on results rather than activities. Before interacting with the candidate(s), start by making a list of results that you would want them to produce. Ask questions pertaining to the list of results you have prepared while simultaneously grading your candidate alongside. This will offer you an insight on your applicant’s future performance in the organisation. Once you are done with asking questions, it’s time that you test their core skills. Many recruiters commit a terrible mistake during the hiring process by hiring a candidate based on what they could do in the future, rather than what they have already done in the past. In order to avoid this hiring redundancy, you must assess their performance by either offering them a case-study to solve or a written test. These activities will help you understand your applicant’s aptitude and their ability to execute a given task. To determine the degree of compatibility between the candidate and your company is highly complex. In fact, nobody can determine it unless they work with you. However, failing to understanding the personality of the candidate you are interviewing can mar your company in the long run. Do not base your judgements on the exceptional talent displayed by your candidates during the personal interaction/interview round. Rely on your instincts and try to determine whether they are really willing to change their attitude as per your requirements in the future? Or are they ready to learn additional skills if required? You could either use professional help or rely on online professional tests to measure personality. These tests are simple and require very little time. For instance, you can administer the MBTY personality test (Myer-Briggs Type Indicator), a psychometric list of questionnaire designed to measure psychological preferences in how employees perceive or identify the world and make decisions. Though the results might not be accurate, but it can give a fair idea about your applicant’s personality. Based on the results generated, you can judge the candidate and decide whether to keep them or reject them. To know more in detail about this approach, get in touch with us at info@handigital.com. We, as Talent Consultants at Han Digital Solution, can guide you in detail regarding this approach. We can also help you recruit the best talent through our expert hiring procedures and recruitment strategies. Get in touch to familiarise yourself with our services.